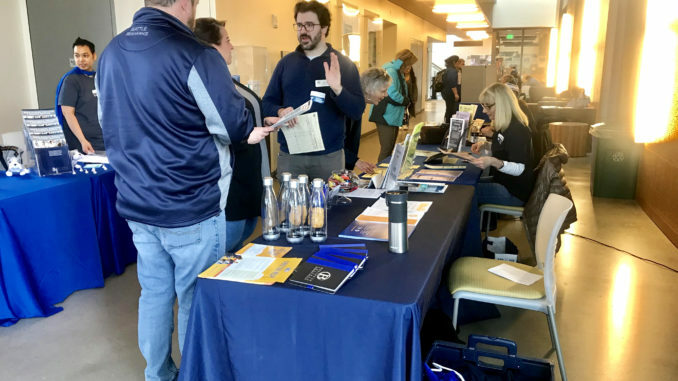 Bellevue College students were able to explore career and educational opportunities at the Health Science, Education and Wellness Institute open house, held Jan. 29 and 30 in the T Building. Representatives for fields such as diagnostic ultrasound technology, parent education and molecular bioscience were on hand to present information and answer any questions students had about their respective fields. At the main booth, students could gather brochures, business cards and a booklet for collecting stickers from each booth, which could be redeemed for prizes. The open house also featured food, live demonstrations, a student/alumni panel, workshops, and information sessions. Laura Hardin, who tended a booth about scholarships, said there are many scholarships available for students interested in health sciences, if only students would take the time to submit applications. “Apply, apply, apply – students just don’t apply,” said Hardin. “Only about 300 [students apply] a year” for the 170 available scholarships. Any Bellevue college student can apply, scholarships can help cover tuition and fees and sometimes can even cover books. According to Hardin, students can apply for many of the scholarships by filling out a single form. Wendy Hatheway of the Parent Education Department tended a booth promoting her department’s program. “This is not an academic program,” said Hatheway. “Our classes are open to everybody.” The program teaches parents about subjects such as child development, discipline, nutrition and technology. “Parents enroll with their children,” said Hatheway. Information for workforce outreach was available at the booth run by Ben Johnson. This program helps students pay for health and other Bellevue College programs. Ben encouraged students to explore workforce outreach in addition to financial age. Another booth, run by Leslie Strand, offered information about financial aid. Strand said most students visiting her booth had question about how to apply for financial aid, “but mostly about deadlines.” Strand added she was “always going to encourage students to apply” for financial aid, because there is no reason not to.